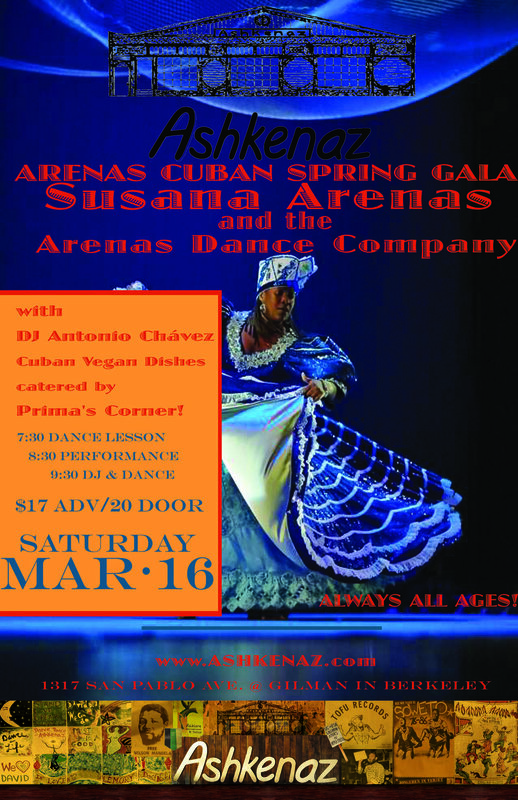 Doors at 7:00 pm; Dance Lesson with Susana Arenas Pedroso at 7:30 pm; Floor Show at 8:30 pm; DJ and Dancing with DJ Antonio at 9:30 pm AND Cuban Vegan food catered by Prima's Cuban Corner! Susana Arenas Pedroso is an internationally recognized Cuban Folkloric and popular dancer. Born and raised in Havana, Cuba, Ms Pedroso began her career in dance at age twelve, studying at La Casa de Cultura de Matanzas and at Conjunto Folklorico Nacional in Havana. She danced professionally for seventeen years in Cuba with popular, folkloric and theatrical groups, including the internationally acclaimed group Raíces Profundas. Since her relocation in the United States in 1998, Ms Pedroso has performed and choreographed numerous pieces that have been exhibited throughout the United States, Mexico, Cuba and Hong Kong. In 2004 Pedroso founded Arenas Dance Company, which specializes in both Cuban folkloric and popular traditions. Now twenty-five dancers and musicians strong, the critically acclaimed company received rave reviews for its “unforgettable” performance at the San Francisco Ethnic Dance Festival in 2018. For the Arenas Spring Cuban Gala at Ashkenaz, Arenas Dance Company will premiere several pieces in a spectacular show that brings together the popular Cuban dances and the sacred Yoruba traditions.